Racing tips: Prince set for Nottingham rule? Daira Prince can strike Nottingham gold for the second time this month in the Watch Racing UK On BT TV Handicap. 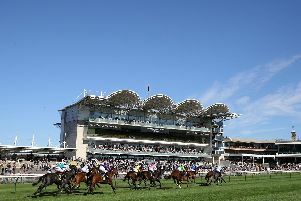 Roger Varian’s charge won at Yarmouth and Leicester last season and also ran creditably in defeat a couple of times. Autumn Leaves is an interesting contender for the British Stallion Studs EBF totequadpot Fillies’ Handicap. The daughter of Helmet filled the runner-up spot on her first two juvenile starts last season before making it third time lucky when justifying odds-on favouritism at Salisbury in August. Elerfaan ran a screamer to finish second when a 66-1 shot for his Wetherby debut last month and can go one better at Beverley. The well-bred son of Shamardal was bought for just £5,000 by his current connections last November, having never run during a spell with Varian. The Richard Fahey-trained Militia rates the best bet at Ripon. After placing in three of his four starts last term, the three-year-old was not winning out of turn when making a successful return at Thirsk three weeks ago. My Renaissance can win at Cartmel for the second time in the Champagne Louis Roederer Handicap Chase. Bandsman can maintain his unbeaten record over larger obstacles in the Watch Racing UK On Virgin 536 Novices’ Chase at Warwick. Cartmel: 2.10 Its Pandorama, 2.40 Geni Johnson, 3.10 Chain Of Beacons, 3.40 Clondaw Kaempfer, 4.10 Unioniste, 4.40 Elysian Prince, 5.15 Tonto’s Spirit. Gowran Park: 5.55 The Lords Walk, 6.25 Koybig, 6.55 Shifted Strategy, 7.30 Law Girl, 8.00 Camile, 8.30 Reddot Express, 9.00 Athena. Nottingham: 2.20 Capla Rock, 2.50 Pulsating, 3.20 Autumn Leaves, 3.50 DAIRA PRINCE (NAP), 4.20 Channel Packet, 4.50 Quantatmental, 5.25 Sarabi. Warwick: 5.05 Mick Maestro, 5.40 Bandsman, 6.10 Champ, 6.45 Included, 7.15 Chase Me, 7.50 Royalraise, 8.20 Crown Hill. Beverley: 1.30 Bottleared, 2.00 Arnold, 2.30 Moonlit Sands, 3.00 Relight My Fire, 3.30 Vive La Difference, 4.00 Metronomic, 4.30 Elerfaan, 5.00 Amadeus. Ripon: 6.35 Smile a Mile, 7.05 Gabrials Centurion, 7.40 Militia, 8.10 Sandra’s Secret, 8.40 Northwest Frontier, 9.10 M C Muldoon.